Several weeks ago on September 5, 2006 the U.S. Food and Drug Administration approved the first ever totally implantable artificial heart. Called the AbioCor, the device was approved under the Humanitarian Use Device (HUD) provisions of the Food, Drug and Cosmetic Act and is intended for people who are not eligible for a heart transplant and who are unlikely to live more than a month without intervention. The FDA has sanctioned a number of HUD's, many of these devices representing the cutting edge of medical technology. From my perspective this seems like a reasonable and ethical policy; as part of the approval process, novel and seemingly radical medical devices should be given to desperate patients who have nothing to lose -- and who will in turn assist greatly to the testing process. A fully implantable artificial heart was finally made possible due to converging advances in miniaturization, biosensors, plastics and energy transfer. The unit runs on a rechargeable source of power and its internal battery is charged by a transcutaneous energy transmission (TET) system. This means that no wires or tubes penetrate the skin creating virtually no risk of infection. The internal battery of the device allows users to move freely for one hour, with external power devices extending endurance to two hours. The device can even be charged/operated using a common household electrical outlet. The AbioCor system consists of: a two-pound mechanical heart that takes over the pumping function of the diseased heart, which is removed during the implantation procedure; a power transfer coil that powers the system across the skin and recharges the internal battery from the outside; and a controller and an internal battery, which are implanted in the patient's abdomen. The controller monitors and controls the functioning of the device, including the pumping rate of the heart. Because AbioCo was approved as a HUD, it is given only to the most desperate of patients. For someone to be eligible for implantation with the AbioCor, the person must have severe heart failure (with failure of both ventricles) and must be likely to die within two weeks without transplantation. While most patients eventually succumb to heart failure, the device has allowed people to prolong their lives anywhere from 3 to 17 months. The first patient to receive the AbioCor was Robert Tools who lived for 151 days before having a fatal cerebrovascular accident. 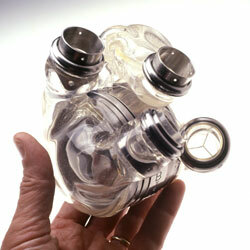 Tom Christerson lived for 512 days after receiving the artificial heart. AbioCor, which is manufactured by Danvers, Mass.-based Abiomed Inc., hopes to make the artificial heart commercially available to treat "a defined subset of not more than 4,000 irreversible end-stage heart failure patients." Sources: Wikipedia, FDA, Business First. We had a discussion about this in one of my classes. One of the main reasons why it is given to only the most hopeless cases is because it only prolongs lifespan by an average of 6 months. It's a last-ditch solution. Such a short therapeutic window is also why many people oppose spending a lot of taxpayer money on this experiment. They argue that such money would be better spent in heart disease prevention. I was under the impression that some of the implantations of the artificial heart were part of a government funded program, but I could be wrong. In any case, some people oppose insurance funding of these extremely expensive devices which provide only marginal returns. Also, this is neither here nor there, but that implantation on Robert Tools was performed about two blocks from where I live here in Louisville. :) The other thing that this medical campus is famous for is the first hand transplant.